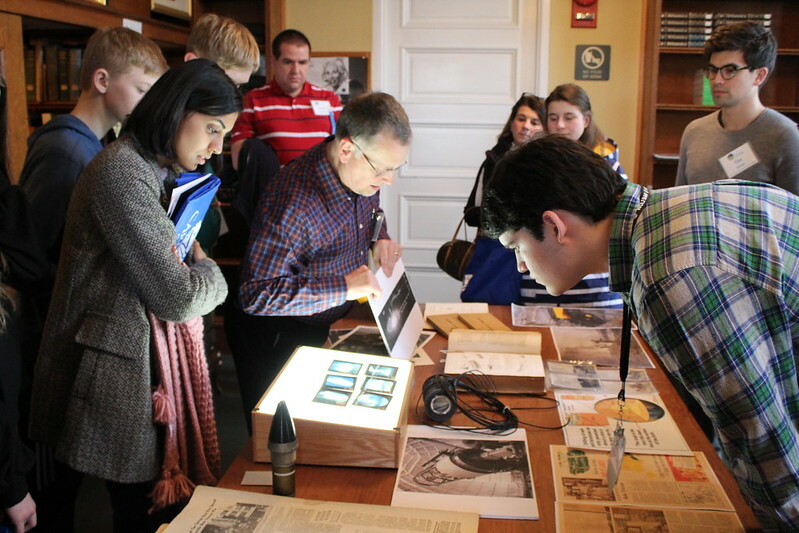 The students, selected to attend the American Junior Academy of Science (AJAS) conference on February 13-17, learned about Carnegie's past, present, and future from BBR librarian Shaun Hardy. Photo: Roberto Molar Candanosa, DTM. Some of the nation's top high school students interested in careers in Science, Technology, Engineering, and Math (STEM) visited the Carnegie Institution for Science Broad Branch Road (BBR) Campus on February 14 for a behind-the-scenes tour of the Department of Terrestrial Magnetism (DTM) and Geophysical Laboratory (GL) research facilities. 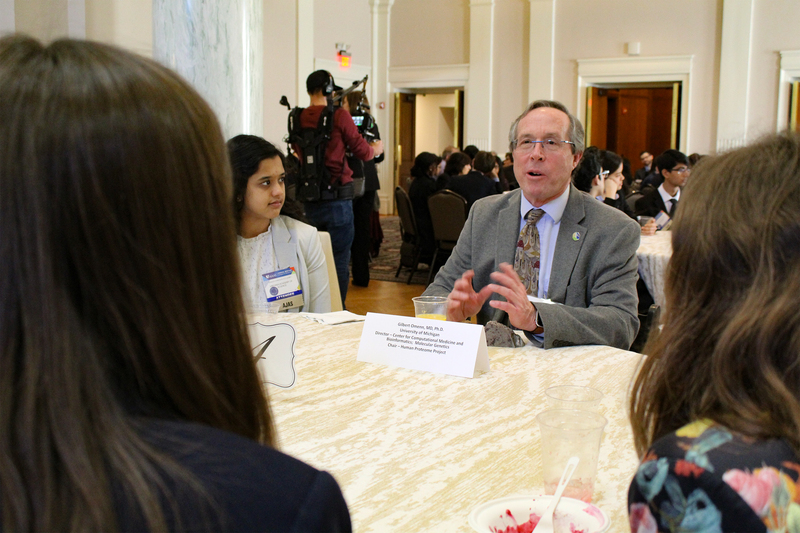 On February 15 the students also attended a "Breakfast with a Scientist" reception hosted at the Carnegie Institution's headquarters, where they mingled with top scientists from Carnegie and other scientific organizations. The visiting students were selected to attend the American Junior Academy of Science (AJAS) conference on February 13-17 held in conjunction with the 2019 Annual Meeting of the American Association for the Advancement of Science (AAAS). They were part of a larger group of 243 high schoolers selected to attend the conference. "The AJAS is a highly selected group of among the most talented, scientifically inclined, high school students in the U.S.," said DTM Director Rick Carlson. "They were impressively schooled in the basics of subjects that I doubt I knew about during high school." DTM and GL astronomers, geophysicists, and geo and cosmochemists met with the 31 students visiting BBR. Prior to their visit, DTM theoretical astrophysicist Alan Boss gave a lecture about the search for life beyond Earth at the AJAS opening ceremony at the Omni Shoreham Hotel in D.C.
DTM's Rick Carlson and Tim Mock led the tour of the mass spectrometry lab. Photo: Roberto Molar Candanosa, DTM. 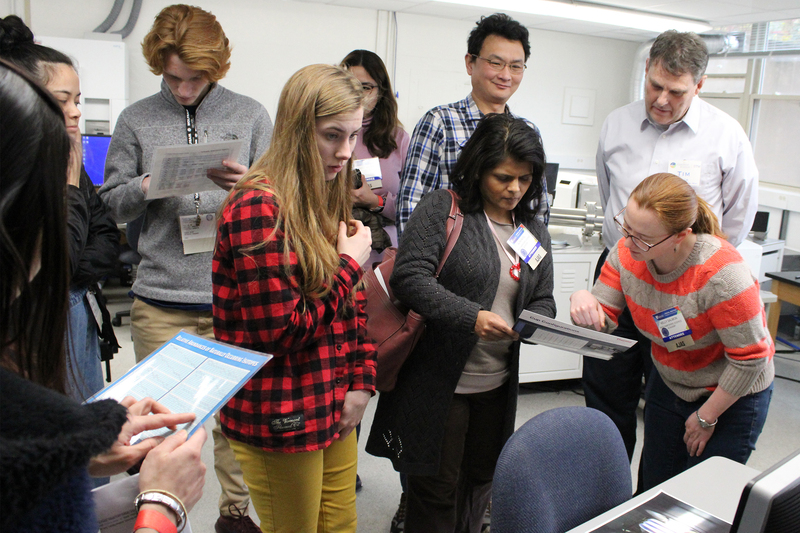 During their tour of the mass spectrometry lab, students had to figure out which elements were being analyzed. This activity involved knowing what isotopes are. "I was prepared to explain this information but they already knew it," Carlson said. "So our discussion went on to applications, like how we use isotopic compositions to detect presolar grains and determine the ages of rocks." Carlson presented a lecture on the origins of the Earth and Moon at Carnegie's headquarters and attended the breakfast on February 15. At the breakfast, which included a larger group of 200, the students were not shy to ask questions and seek advice. "I was really impressed by their forward-thinking of what it's like to live a life of a scientist," said DTM volcanologist Diana Roman, who co-led the seismology tour at BBR with seismologist Lara Wagner. DTM's Larry Nittler also emphasized the students' excitement about research and their future plans. "They were deeply curious about how science works in the real world," he said, "for example, funding, applied versus basic science, or academic versus non-academic research." Nittler also led a tour of DTM's cosmochemistry lab. The "Breakfast with a Scientist" event included DTM Director Rick Carlson, who brought rock samples to the table. Photo: Roberto Molar Candanosa, DTM. 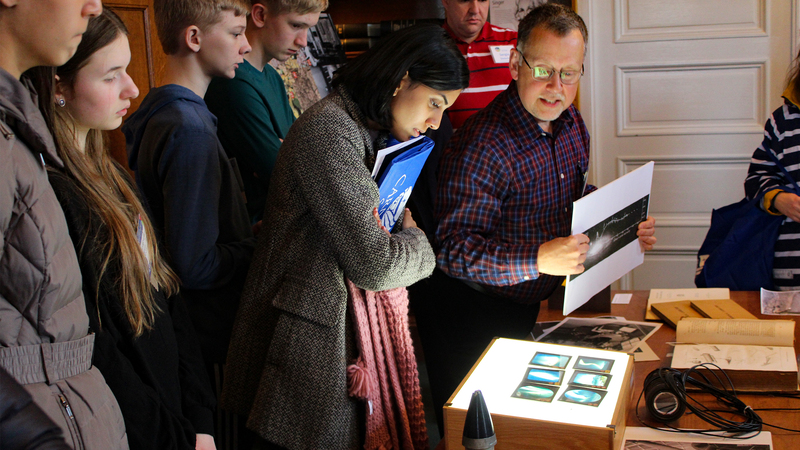 At BBR students also ventured into the high-pressure geophysics lab with GL Director Mike Walter and the electron microscopy instruments with Emma Bullock, who showed students how to analyze a meteorite from the asteroid belt. "They got to see that it is made up of silicates, metals, and sulfides," Bullock said, "and is similar in many ways to some rocks on Earth." At GL's Hydrothermal Lab, experimental geochemist Dionysis Foustoukos led the high schoolers on a journey deep inside Earth. "We discussed the cycling of water inside the Earth and the role of mid-ocean ridge magmatic systems in transferring energy and matter from the Earth's interior to the oceans," Foustoukos said. Pulling students back from Earth's interior, DTM's Scott Sheppard took the students to the darkest and coldest places of the Solar System—from the comfort of the astronomy library. The AJAS tours included further stops with BBR Librarian Shaun Hardy and Machinist Victor Lugo, who manages the making of scientific instruments on campus. The students were accompanied all day by various DTM and GL postdocs, as well as AJAS chaperons. DTM volcanologist Diana Roman talked to the students about the Carnegie Quick Deploy Boxes in the seismology laboratory. Photo: Roberto Molar Candanosa, DTM. Carlson emphasized the importance of hosting events like this, which go hand-in-hand with Carnegie's vision of science. "The Carnegie Institution was founded to foster basic science research in the belief that science has a lot to contribute to the betterment of humankind," he said. "I'm extremely pleased to see that Carnegie welcomes the next generation of scientists as represented by the AJAS students, letting them see the excitement and merit of basic research." As part of its mission, the AJAS arranges unique events to immerse students into science and meet real-world scientists. Other field trips arranged by the AJAS in the area included NASA's Goddard Space Flight Center, the National Institute of Standards and Technology, the National Institutes of Health, and the USDA's Beltsville Agricultural Research Center.